System administrators often find it a struggle to restore Active Directory objects, such as deleted AD user accounts, OUs and groups. Since no IT environment is immune from incorrect modifications and unauthorized changes, admins have to be equipped to recover deleted AD users and other objects within minutes so they can prevent interruptions to critical business processes. Netwrix Auditor for Active Directory empowers you to quickly recover deleted Active Directory user or computer accounts, groups and organizational units to a previous state — without having to reboot a domain controller or restore from backup. The solution goes far beyond the standard tombstone capabilities. By storing much more information in its state-in-time snapshots, it enables you not only to restore deleted AD accounts, but also to revert modified and incorrectly added objects. Identify the day and the time you want to revert the object to. 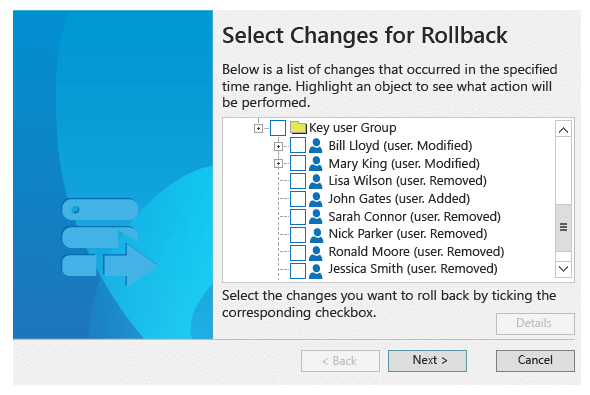 Select the rollback source: either a state-in-time snapshot taken by Netwrix Auditor or an AD tombstone. Choose the changes you want to revert.